Tim Plyming, gives you a preview of what to expect from the live screening of Life and death in Pompeii and Herculaneum coming to cinemas across the UK to bring you a 'private view' experience of the museum's latest exhibition. At time of writing we are under a week away from two live cinema events for the British Museum exhibition Life and death in Pompeii and Herculaneum, and I wanted to give you a bit more detail about what we are planning, as well as a glimpse behind the scenes at the huge amount of activity now taking place. Our ambition from the beginning has been to provide an exclusive ‘private view’ experience of the exhibition. We realised the best way to experience the exhibition was to have a ‘private guided tour’ in the presence of experts able to bring the objects to life through the stories they tell. This ‘private tour’ experience is of course not one that we can offer every visitor to the Museum but through a special event such as Pompeii Live we can, for one night and using the power of live satellite broadcasting, bring that experience directly into cinemas across the UK. We are thrilled at visitors planning to join us from as far afield as Thurso, Swansea, Belfast, Plymouth and Norwich. Over 80% of the available tickets have been sold, so we are telling visitors to make sure they have their ticket in advance if they want to join us live. Over the 80-minute broadcast, visitors will be led by our main presenters, Peter Snow and Bettany Hughes. They will be joined by specialist contributors including historians Mary Beard and Andrew Wallace-Hadrill, chef Giorgio Locatelli and, broadcaster and gardening expert, Rachel De Thame. We feel very privileged to have such an amazing line-up who will take us much closer to the people of these tragic cities and what their daily lives were like. Giorgio Locatelli, for example, has been experimenting in his kitchen in central London with a recipe for the carbonised loaf of the bread – one of the star objects in the exhibition. We have already started our rehearsals and preparations for the show and feel certain that audiences are in for a real treat when they join us live on the night. 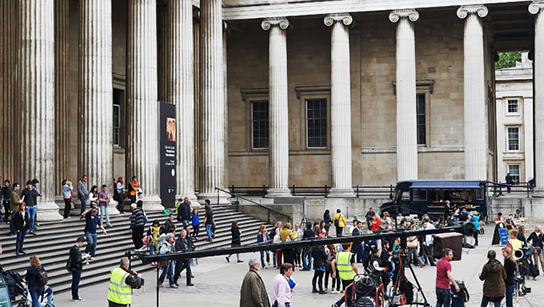 On Monday, the outside broadcast vehicles arrive at the Museum and we start the process of – overnight – building a live broadcast studio in the heart of the British Museum. On Tuesday 18 June we rehearse the event and are then live to over 280 cinemas across the UK at 19.00 BST. Following the live broadcast, over 1,000 cinemas across the world in over 60 territories will show a recorded ‘as live’ version of the event. This will be shown in cinemas as far flung as China, India and the USA. In addition to our main broadcast event on Tuesday 18 June, our team has developed a live cinema event for school audiences. This will allow schools across the UK to go to their local cinema and be transported live to the British Museum to explore the objects in the exhibition as well as content designed to link to Key Stage two subject areas. They’ll be guided by presenters Naomi Wilkinson and Ed Petrie, as well as a cast of specialist contributors. You can find your nearest participating cinema, in the UK and across the world, on our website at britishmuseum.org/pompeiilive and follow preparations for both live events on Twitter using #PompeiiLive. Exhibition sponsored by Goldman Sachs.